It's lit! 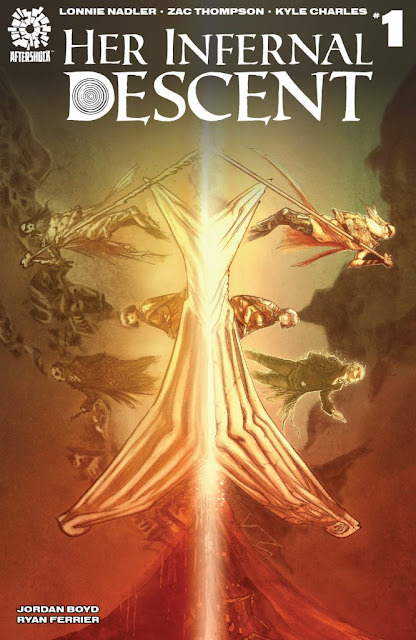 As in literature, AfterShock's 'Her Infernal Descent' retells Dante's Inferno with updated themes for a modern audience.The writers of one of our Best of 2017 picks The Dregs and the artist of Roche Limit: Clandestiny and Monadic take readers on a classic adventure. Lonnie Nadler and Zac Thompson could have written anything but as literary geeks, their true passion won out and it shows in the debut issue of 'Her Infernal Descent.' There's also a sense of personal sorrow that permeates the pages beyond the story that I can't confirm but feels like the despair of the protagonist comes from a real place. In any case, the emotional beats ring true whatever the reason and Kyle Charles sets the tone right out of the gate. A home in total neglect, rooms full of trash and a quiet emptiness that fills each of the opening panels. A middle-aged woman lurks in an almost zombie-state going through the motions seemingly given up on life while mourning a family loss to death. Her train of thought is captioned describing her sadness, missing the loved ones that made her life whole. Nadler and Thompson capture her pain eloquently and sincerely. The silence is broken when the woman ventures to the attic and discovers the apparition of 19th-century poet William Blake. "If thou will trek through the hell's circle's nine, thy family shall once again be thine," he offered. At first, she was resistant but the thought of being reunited with her family even by traversing hell with a ghost is well worth the effort. And so they begin their journey to hell, Blake rhyming his responses the entire way, and coming across some other famous figures living in limbo. Charles is tasked with creating a version of the afterlife that does justice to its literary influences. Luckily, Charles is up to the task with a vast ever-changing landscape that traverses dry desert-like conditions, a seemingly moonlit ocean voyage, to a frozen tundra, all populated with some familiar faces among the lost souls. Dee Cunniffe's colors add layers of depth affecting the mood of each scene. The dark grays from the woman's lonely existence at home to the bright sense of hope entering the gateway to the afterlife, Cunniffe captures the perfect emotional hues to interpret the story. 'Her Infernal Descent' is a literature lover's dream that takes the familiar road through hell with enough twists and turns to make this a grand adventure worth taking. One woman's pain and grief are turned to unyielding hope and determination where not even the ghost of people like Edgar Allen Poe fazes her. Told with consistent charm and wit, 'Her Infernal Descent' has all the makings of a hit series.